RM Contracts is a trusted Harrogate roofer and builder, with over 30 years of experience. We are based in Harrogate, North Yorkshire and also serve the surrounding towns including Knaresborough, Ripon, Pateley Bridge, and Wetherby. We have been operating in the Harrogate area for over three decades and have established a proven track record of excellence in roofing and building due to our quality workmanship and customer service. RM Contracts specialises in all kinds of roofing and building projects for both residential and commercial buildings. Our services range from simple roof repairs and home renovations to full-scale re-roofing and extensions. Our roofing and building services include GRP roofs and flat roofs, roof repairs including both slate and tile repairs, chimney repairs, building dry ridge systems and dry verge systems, and fascia’s, soffits and guttering. Our expertise is not only limited to roofing. We are a continually growing team of professional builders who offer support for all kinds of building projects from small scale residential restorations to basement conversions and home extensions. Whether you need to get a small job done like replacing a missing slate or you need a contractor for a large scale re-roofing project, RM Contracts is your one-stop solution. We also offer emergency build and repair services in case of inclement weather has taken a toll on your property because we understand the importance of having a watertight and secure living environment. RM Contracts are fully insured and offer guarantees on all our roofing and building services. 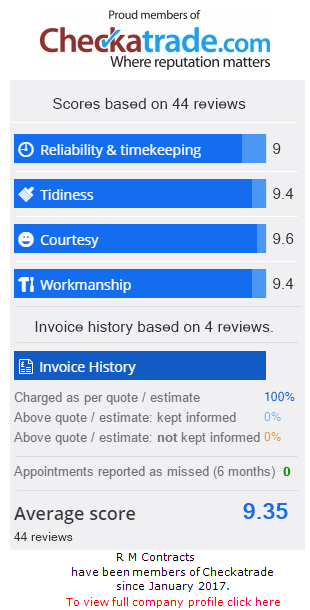 This is why RM Contracts’ clients enjoy complete peace of mind knowing that our work will stand the test of time. We take great pride in offering the best quality of work. RM Contracts is a member of the Guild of Master Craftsmen and The Confederation of Roofing Contractors. Our customer has always been our main focus and we believe in going that extra mile to exceed their expectations and deliver on every project within time and budget. If you are a property owner in Harrogate, Knaresborough, Ripon, Pateley Bridge or Wetherby looking for a trusted local roofing and building contractor, then RM Contracts is the right choice for you. Feel free to contact us at any time for free advice or to know more about our services. We would love to hear from you. We do not believe in one size fits all approach. We follow the most unique working process where the cost of the project is determined according to your particular need. We not only assure the most competitive pricing but also provide superior customer support. We start by discussing all your requirements and provide you with complete details about the required work, time and cost. Our work is based on a simple work ethic, which is to provide our clients with the best workmanship regardless of how big or small is a project.